For other uses, see Mind (disambiguation). René Descartes' illustration of mind/body dualism. Descartes believed inputs are passed on by the Sensory organs to the epiphysis in the brain and from there to the immaterial spirit. The mind (not to be confused with the brain) is a set of cognitive faculties including consciousness, imagination, perception, thinking, judgement, language and memory. It is usually defined as the faculty of an entity's thoughts and consciousness. It holds the power of imagination, recognition, and appreciation, and is responsible for processing feelings and emotions, resulting in attitudes and actions. There is a lengthy tradition in philosophy, religion, psychology, and cognitive science about what constitutes a mind and what are its distinguishing properties. One open question regarding the nature of the mind is the mind–body problem, which investigates the relation of the mind to the physical brain and nervous system. Older viewpoints included dualism and idealism, which considered the mind somehow non-physical. Modern views often center around physicalism and functionalism, which hold that the mind is roughly identical with the brain or reducible to physical phenomena such as neuronal activity[need quotation to verify], though dualism and idealism continue to have many supporters. Another question concerns which types of beings are capable of having minds (New Scientist 8 September 2018 p10). For example, whether mind is exclusive to humans, possessed also by some or all animals, by all living things, whether it is a strictly definable characteristic at all, or whether mind can also be a property of some types of human-made machines. Whatever its nature, it is generally agreed that mind is that which enables a being to have subjective awareness and intentionality towards their environment, to perceive and respond to stimuli with some kind of agency, and to have consciousness, including thinking and feeling. The concept of mind is understood in many different ways by many different cultural and religious traditions. Some see mind as a property exclusive to humans whereas others ascribe properties of mind to non-living entities (e.g. panpsychism and animism), to animals and to deities. Some of the earliest recorded speculations linked mind (sometimes described as identical with soul or spirit) to theories concerning both life after death, and cosmological and natural order, for example in the doctrines of Zoroaster, the Buddha, Plato, Aristotle, and other ancient Greek, Indian and, later, Islamic and medieval European philosophers. Important philosophers of mind include Plato, Patanjali, Descartes, Leibniz, Locke, Berkeley, Hume, Kant, Hegel, Schopenhauer, Searle, Dennett, Fodor, Nagel, and Chalmers. Psychologists such as Freud and James, and computer scientists such as Turing and Putnam developed influential theories about the nature of the mind. The possibility of nonbiological minds is explored in the field of artificial intelligence, which works closely in relation with cybernetics and information theory to understand the ways in which information processing by nonbiological machines is comparable or different to mental phenomena in the human mind. The mind is also portrayed as the stream of consciousness where sense impressions and mental phenomena are constantly changing. The original meaning of Old English gemynd was the faculty of memory, not of thought in general. Hence call to mind, come to mind, keep in mind, to have mind of, etc. The word retains this sense in Scotland. Old English had other words to express "mind", such as hyge "mind, spirit". The meaning of "memory" is shared with Old Norse, which has munr. The word is originally from a PIE verbal root *men-, meaning "to think, remember", whence also Latin mens "mind", Sanskrit manas "mind" and Greek μένος "mind, courage, anger". The generalization of mind to include all mental faculties, thought, volition, feeling and memory, gradually develops over the 14th and 15th centuries. The attributes that make up the mind are debated. Some psychologists argue that only the "higher" intellectual functions constitute mind, particularly reason and memory. In this view the emotions — love, hate, fear, and joy — are more primitive or subjective in nature and should be seen as different from the mind as such. Others argue that various rational and emotional states cannot be so separated, that they are of the same nature and origin, and should therefore be considered all part of it as mind. In popular usage, mind is frequently synonymous with thought: the private conversation with ourselves that we carry on "inside our heads." Thus we "make up our minds," "change our minds" or are "of two minds" about something. One of the key attributes of the mind in this sense is that it is a private sphere to which no one but the owner has access. No one else can "know our mind." They can only interpret what we consciously or unconsciously communicate. Broadly speaking, mental faculties are the various functions of the mind, or things the mind can "do". Thought is a mental act that allows humans to make sense of things in the world, and to represent and interpret them in ways that are significant, or which accord with their needs, attachments, goals, commitments, plans, ends, desires, etc. Thinking involves the symbolic or semiotic mediation of ideas or data, as when we form concepts, engage in problem solving, reasoning, and making decisions. Words that refer to similar concepts and processes include deliberation, cognition, ideation, discourse and imagination. Thinking is sometimes described as a "higher" cognitive function and the analysis of thinking processes is a part of cognitive psychology. It is also deeply connected with our capacity to make and use tools; to understand cause and effect; to recognize patterns of significance; to comprehend and disclose unique contexts of experience or activity; and to respond to the world in a meaningful way. Memory is the ability to preserve, retain, and subsequently recall, knowledge, information or experience. Although memory has traditionally been a persistent theme in philosophy, the late nineteenth and early twentieth centuries also saw the study of memory emerge as a subject of inquiry within the paradigms of cognitive psychology. In recent decades, it has become one of the pillars of a new branch of science called cognitive neuroscience, a marriage between cognitive psychology and neuroscience. Imagination is the activity of generating or evoking novel situations, images, ideas or other qualia in the mind. It is a characteristically subjective activity, rather than a direct or passive experience. The term is technically used in psychology for the process of reviving in the mind percepts of objects formerly given in sense perception. Since this use of the term conflicts with that of ordinary language, some psychologists have preferred to describe this process as "imaging" or "imagery" or to speak of it as "reproductive" as opposed to "productive" or "constructive" imagination. Things imagined are said to be seen in the "mind's eye". Among the many practical functions of imagination are the ability to project possible futures (or histories), to "see" things from another's perspective, and to change the way something is perceived, including to make decisions to respond to, or enact, what is imagined. Consciousness in mammals (this includes humans) is an aspect of the mind generally thought to comprise qualities such as subjectivity, sentience, and the ability to perceive the relationship between oneself and one's environment. It is a subject of much research in philosophy of mind, psychology, neuroscience, and cognitive science. Some philosophers divide consciousness into phenomenal consciousness, which is subjective experience itself, and access consciousness, which refers to the global availability of information to processing systems in the brain. Phenomenal consciousness has many different experienced qualities, often referred to as qualia. Phenomenal consciousness is usually consciousness of something or about something, a property known as intentionality in philosophy of mind. Mental contents are those items that are thought of as being "in" the mind, and capable of being formed and manipulated by mental processes and faculties. Examples include thoughts, concepts, memories, emotions, percepts and intentions. Philosophical theories of mental content include internalism, externalism, representationalism and intentionality. Memetics is a theory of mental content based on an analogy with Darwinian evolution, which was originated by Richard Dawkins and Douglas Hofstadter in the 1980s. It is an evolutionary model of cultural information transfer. A meme, analogous to a gene, is an idea, belief, pattern of behaviour (etc.) "hosted" in one or more individual minds, and can reproduce itself from mind to mind. Thus what would otherwise be regarded as one individual influencing another to adopt a belief, is seen memetically as a meme reproducing itself. In animals, the brain, or encephalon (Greek for "in the head"), is the control center of the central nervous system, responsible for thought. In most animals, the brain is located in the head, protected by the skull and close to the primary sensory apparatus of vision, hearing, equilibrioception, taste and olfaction. While all vertebrates have a brain, most invertebrates have either a centralized brain or collections of individual ganglia. Primitive animals such as sponges do not have a brain at all. Brains can be extremely complex. For example, the human brain contains around 86 billion neurons, each linked to as many as 10,000 others. Understanding the relationship between the brain and the mind – mind–body problem is one of the central issues in the history of philosophy – is a challenging problem both philosophically and scientifically. There are three major philosophical schools of thought concerning the answer: dualism, materialism, and idealism. Dualism holds that the mind exists independently of the brain; materialism holds that mental phenomena are identical to neuronal phenomena; and idealism holds that only mental phenomena exist. Through most of history many philosophers found it inconceivable that cognition could be implemented by a physical substance such as brain tissue (that is neurons and synapses). Descartes, who thought extensively about mind-brain relationships, found it possible to explain reflexes and other simple behaviors in mechanistic terms, although he did not believe that complex thought, and language in particular, could be explained by reference to the physical brain alone. The most straightforward scientific evidence of a strong relationship between the physical brain matter and the mind is the impact physical alterations to the brain have on the mind, such as with traumatic brain injury and psychoactive drug use. Philosopher Patricia Churchland notes that this drug-mind interaction indicates an intimate connection between the brain and the mind. In addition to the philosophical questions, the relationship between mind and brain involves a number of scientific questions, including understanding the relationship between mental activity and brain activity, the exact mechanisms by which drugs influence cognition, and the neural correlates of consciousness. Theoretical approaches to explain how mind emerges from the brain include connectionism, computationalism and Bayesian brain. The evolution of human intelligence refers to several theories that aim to describe how human intelligence has evolved in relation to the evolution of the human brain and the origin of language. The timeline of human evolution spans some 7 million years, from the separation of the genus Pan until the emergence of behavioral modernity by 50,000 years ago. Of this timeline, the first 3 million years concern Sahelanthropus, the following 2 million concern Australopithecus, while the final 2 million span the history of actual Homo species (the Paleolithic). Many traits of human intelligence, such as empathy, theory of mind, mourning, ritual, and the use of symbols and tools, are already apparent in great apes although in lesser sophistication than in humans. There is a debate between supporters of the idea of a sudden emergence of intelligence, or "Great leap forward" and those of a gradual or continuum hypothesis. The ecological dominance-social competition (EDSC) explained by Mark V. Flinn, David C. Geary and Carol V. Ward based mainly on work by Richard D. Alexander. The idea of intelligence as a signal of good health and resistance to disease. The Group selection theory contends that organism characteristics that provide benefits to a group (clan, tribe, or larger population) can evolve despite individual disadvantages such as those cited above. The idea that intelligence is connected with nutrition, and thereby with status. A higher IQ could be a signal that an individual comes from and lives in a physical and social environment where nutrition levels are high, and vice versa. Philosophy of mind is the branch of philosophy that studies the nature of the mind, mental events, mental functions, mental properties, consciousness and their relationship to the physical body. The mind–body problem, i.e. the relationship of the mind to the body, is commonly seen as the central issue in philosophy of mind, although there are other issues concerning the nature of the mind that do not involve its relation to the physical body. José Manuel Rodriguez Delgado writes, "In present popular usage, soul and mind are not clearly differentiated and some people, more or less consciously, still feel that the soul, and perhaps the mind, may enter or leave the body as independent entities." Dualism and monism are the two major schools of thought that attempt to resolve the mind–body problem. Dualism is the position that mind and body are in some way separate from each other. It can be traced back to Plato, Aristotle and the Nyaya, Samkhya and Yoga schools of Hindu philosophy, but it was most precisely formulated by René Descartes in the 17th century. Substance dualists argue that the mind is an independently existing substance, whereas Property dualists maintain that the mind is a group of independent properties that emerge from and cannot be reduced to the brain, but that it is not a distinct substance. The 20th century philosopher Martin Heidegger suggested that subjective experience and activity (i.e. the "mind") cannot be made sense of in terms of Cartesian "substances" that bear "properties" at all (whether the mind itself is thought of as a distinct, separate kind of substance or not). This is because the nature of subjective, qualitative experience is incoherent in terms of – or semantically incommensurable with the concept of – substances that bear properties. This is a fundamentally ontological argument. The philosopher of cognitive science Daniel Dennett, for example, argues there is no such thing as a narrative center called the "mind", but that instead there is simply a collection of sensory inputs and outputs: different kinds of "software" running in parallel. Psychologist B.F. Skinner argued that the mind is an explanatory fiction that diverts attention from environmental causes of behavior; he considered the mind a "black box" and thought that mental processes may be better conceived of as forms of covert verbal behavior. Philosopher David Chalmers has argued that the third person approach to uncovering mind and consciousness is not effective, such as looking into other's brains or observing human conduct, but that a first person approach is necessary. Such a first person perspective indicates that the mind must be conceptualized as something distinct from the brain. The mind has also been described as manifesting from moment to moment, one thought moment at a time as a fast flowing stream, where sense impressions and mental phenomena are constantly changing. Monism is the position that mind and body are not physiologically and ontologically distinct kinds of entities. This view was first advocated in Western Philosophy by Parmenides in the 5th Century BC and was later espoused by the 17th Century rationalist Baruch Spinoza. According to Spinoza's dual-aspect theory, mind and body are two aspects of an underlying reality which he variously described as "Nature" or "God". Physicalists argue that only the entities postulated by physical theory exist, and that the mind will eventually be explained in terms of these entities as physical theory continues to evolve. Idealists maintain that the mind is all that exists and that the external world is either mental itself, or an illusion created by the mind. Neutral monists adhere to the position that perceived things in the world can be regarded as either physical or mental depending on whether one is interested in their relationship to other things in the world or their relationship to the perceiver. For example, a red spot on a wall is physical in its dependence on the wall and the pigment of which it is made, but it is mental in so far as its perceived redness depends on the workings of the visual system. Unlike dual-aspect theory, neutral monism does not posit a more fundamental substance of which mind and body are aspects. The most common monisms in the 20th and 21st centuries have all been variations of physicalism; these positions include behaviorism, the type identity theory, anomalous monism and functionalism. Many modern philosophers of mind adopt either a reductive or non-reductive physicalist position, maintaining in their different ways that the mind is not something separate from the body. These approaches have been particularly influential in the sciences, e.g. in the fields of sociobiology, computer science, evolutionary psychology and the various neurosciences. Other philosophers, however, adopt a non-physicalist position which challenges the notion that the mind is a purely physical construct. Reductive physicalists assert that all mental states and properties will eventually be explained by scientific accounts of physiological processes and states. Non-reductive physicalists argue that although the brain is all there is to the mind, the predicates and vocabulary used in mental descriptions and explanations are indispensable, and cannot be reduced to the language and lower-level explanations of physical science. Continued progress in neuroscience has helped to clarify many of these issues, and its findings have been taken by many to support physicalists' assertions. Nevertheless, our knowledge is incomplete, and modern philosophers of mind continue to discuss how subjective qualia and the intentional mental states can be naturally explained. Then, of course, there is the problem of Quantum Mechanics, which is best understood as a form of perspectivism. Simplified diagram of Spaun, a 2.5-million-neuron computational model of the brain. (A) The corresponding physical regions and connections of the human brain. (B) The mental architecture of Spaun. Neuroscience studies the nervous system, the physical basis of the mind. At the systems level, neuroscientists investigate how biological neural networks form and physiologically interact to produce mental functions and content such as reflexes, multisensory integration, motor coordination, circadian rhythms, emotional responses, learning, and memory. At a larger scale, efforts in computational neuroscience have developed large-scale models that simulate simple, functioning brains. As of 2012, such models include the thalamus, basal ganglia, prefrontal cortex, motor cortex, and occipital cortex, and consequentially simulated brains can learn, respond to visual stimuli, coordinate motor responses, form short-term memories, and learn to respond to patterns. Currently, researchers aim to program the hippocampus and limbic system, hypothetically imbuing the simulated mind with long-term memory and crude emotions. By contrast, affective neuroscience studies the neural mechanisms of personality, emotion, and mood primarily through experimental tasks. Cognitive science examines the mental functions that give rise to information processing, termed cognition. These include perception, attention, working memory, long-term memory, producing and understanding language, learning, reasoning, problem solving, and decision making. Cognitive science seeks to understand thinking "in terms of representational structures in the mind and computational procedures that operate on those structures". Psychology is the scientific study of human behavior, mental functioning, and experience. As both an academic and applied discipline, Psychology involves the scientific study of mental processes such as perception, cognition, emotion, personality, as well as environmental influences, such as social and cultural influences, and interpersonal relationships, in order to devise theories of human behavior. Psychological patterns can be understood as low cost ways of information processing. Psychology also refers to the application of such knowledge to various spheres of human activity, including problems of individuals' daily lives and the treatment of mental health problems. Psychology differs from the other social sciences (e.g. anthropology, economics, political science, and sociology) due to its focus on experimentation at the scale of the individual, or individuals in small groups as opposed to large groups, institutions or societies. Historically, psychology differed from biology and neuroscience in that it was primarily concerned with mind rather than brain. Modern psychological science incorporates physiological and neurological processes into its conceptions of perception, cognition, behaviour, and mental disorders. By analogy with the health of the body, one can speak metaphorically of a state of health of the mind, or mental health. Merriam-Webster defines mental health as "A state of emotional and psychological well-being in which an individual is able to use his or her cognitive and emotional capabilities, function in society, and meet the ordinary demands of everyday life." According to the World Health Organization (WHO), there is no one "official" definition of mental health. Cultural differences, subjective assessments, and competing professional theories all affect how "mental health" is defined. In general, most experts agree that "mental health" and "mental disorder" are not opposites. In other words, the absence of a recognized mental disorder is not necessarily an indicator of mental health. One way to think about mental health is by looking at how effectively and successfully a person functions. Feeling capable and competent; being able to handle normal levels of stress, maintaining satisfying relationships, and leading an independent life; and being able to "bounce back," or recover from difficult situations, are all signs of mental health. Psychotherapy is an interpersonal, relational intervention used by trained psychotherapists to aid clients in problems of living. This usually includes increasing individual sense of well-being and reducing subjective discomforting experience. Psychotherapists employ a range of techniques based on experiential relationship building, dialogue, communication and behavior change and that are designed to improve the mental health of a client or patient, or to improve group relationships (such as in a family). Most forms of psychotherapy use only spoken conversation, though some also use various other forms of communication such as the written word, art, drama, narrative story, or therapeutic touch. Psychotherapy occurs within a structured encounter between a trained therapist and client(s). Purposeful, theoretically based psychotherapy began in the 19th century with psychoanalysis; since then, scores of other approaches have been developed and continue to be created. Animal cognition, or cognitive ethology, is the title given to a modern approach to the mental capacities of animals. It has developed out of comparative psychology, but has also been strongly influenced by the approach of ethology, behavioral ecology, and evolutionary psychology. Much of what used to be considered under the title of "animal intelligence" is now thought of under this heading. Animal language acquisition, attempting to discern or understand the degree to which animal cognition can be revealed by linguistics-related study, has been controversial among cognitive linguists. Computer simulation of the branching architecture of the dendrites of pyramidal neurons. In 1950 Alan M. Turing published "Computing machinery and intelligence" in Mind, in which he proposed that machines could be tested for intelligence using questions and answers. This process is now named the Turing Test. The term Artificial Intelligence (AI) was first used by John McCarthy who considered it to mean "the science and engineering of making intelligent machines". It can also refer to intelligence as exhibited by an artificial (man-made, non-natural, manufactured) entity. AI is studied in overlapping fields of computer science, psychology, neuroscience and engineering, dealing with intelligent behavior, learning and adaptation and usually developed using customized machines or computers. Research in AI is concerned with producing machines to automate tasks requiring intelligent behavior. Examples include control, planning and scheduling, the ability to answer diagnostic and consumer questions, handwriting, natural language, speech and facial recognition. As such, the study of AI has also become an engineering discipline, focused on providing solutions to real life problems, knowledge mining, software applications, strategy games like computer chess and other video games. One of the biggest limitations of AI is in the domain of actual machine comprehension. Consequentially natural language understanding and connectionism (where behavior of neural networks is investigated) are areas of active research and development. The debate about the nature of the mind is relevant to the development of artificial intelligence. If the mind is indeed a thing separate from or higher than the functioning of the brain, then hypothetically it would be much more difficult to recreate within a machine, if it were possible at all. If, on the other hand, the mind is no more than the aggregated functions of the brain, then it will be possible to create a machine with a recognisable mind (though possibly only with computers much different from today's), by simple virtue of the fact that such a machine already exists in the form of the human brain. Many religions associate spiritual qualities to the human mind. These are often tightly connected to their mythology and ideas of afterlife. The Indian philosopher-sage Sri Aurobindo attempted to unite the Eastern and Western psychological traditions with his integral psychology, as have many philosophers and New religious movements. Judaism teaches that "moach shalit al halev", the mind rules the heart. Humans can approach the Divine intellectually, through learning and behaving according to the Divine Will as enclothed in the Torah, and use that deep logical understanding to elicit and guide emotional arousal during prayer. Christianity has tended to see the mind as distinct from the soul (Greek nous) and sometimes further distinguished from the spirit. Western esoteric traditions sometimes refer to a mental body that exists on a plane other than the physical. Hinduism's various philosophical schools have debated whether the human soul (Sanskrit atman) is distinct from, or identical to, Brahman, the divine reality. Taoism sees the human being as contiguous with natural forces, and the mind as not separate from the body. Confucianism sees the mind, like the body, as inherently perfectible. Buddhist teachings explain the moment-to-moment manifestation of the mind-stream. The components that make up the mind are known as the five aggregates (i.e., material form, feelings, perception, volition, and sensory consciousness), which arise and pass away continuously. The arising and passing of these aggregates in the present moment is described as being influenced by five causal laws: biological laws, psychological laws, physical laws, volitional laws, and universal laws. The Buddhist practice of mindfulness involves attending to this constantly changing mind-stream. According to Buddhist philosopher Dharmakirti, the mind has two fundamental qualities: "clarity and cognizes". If something is not those two qualities, it cannot validly be called mind. "Clarity" refers to the fact that mind has no color, shape, size, location, weight, or any other physical characteristic, and "cognizes" that it functions to know or perceive objects. "Knowing" refers to the fact that mind is aware of the contents of experience, and that, in order to exist, mind must be cognizing an object. You cannot have a mind – whose function is to cognize an object – existing without cognizing an object. Mind, in Buddhism, is also described as being "space-like" and "illusion-like". Mind is space-like in the sense that it is not physically obstructive. It has no qualities which would prevent it from existing. In Mahayana Buddhism, mind is illusion-like in the sense that it is empty of inherent existence. This does not mean it does not exist, it means that it exists in a manner that is counter to our ordinary way of misperceiving how phenomena exist, according to Buddhism. When the mind is itself cognized properly, without misperceiving its mode of existence, it appears to exist like an illusion. There is a big difference however between being "space and illusion" and being "space-like" and "illusion-like". Mind is not composed of space, it just shares some descriptive similarities to space. Mind is not an illusion, it just shares some descriptive qualities with illusions. Buddhism posits that there is no inherent, unchanging identity (Inherent I, Inherent Me) or phenomena (Ultimate self, inherent self, Atman, Soul, Self-essence, Jiva, Ishvara, humanness essence, etc.) which is the experiencer of our experiences and the agent of our actions. In other words, human beings consist of merely a body and a mind, and nothing extra. Within the body there is no part or set of parts which is – by itself or themselves – the person. Similarly, within the mind there is no part or set of parts which are themselves "the person". A human being merely consists of five aggregates, or skandhas and nothing else. In the same way, "mind" is what can be validly conceptually labelled onto our mere experience of clarity and knowing. There is something separate and apart from clarity and knowing which is "Awareness", in Buddhism. "Mind" is that part of experience the sixth sense door, which can be validly referred to as mind by the concept-term "mind". There is also not "objects out there, mind in here, and experience somewhere in-between". There is a third thing called "awareness" which exists being aware of the contents of mind and what mind cognizes. There are five senses (arising of mere experience: shapes, colors, the components of smell, components of taste, components of sound, components of touch) and mind as the sixth institution; this means, expressly, that there can be a third thing called "awareness" and a third thing called "experiencer who is aware of the experience". This awareness is deeply related to "no-self" because it does not judge the experience with craving or aversion. To be aware of these four levels one needs to cultivate equanimity toward Craving and Aversion. This is Called Vipassana which is different from the way of reacting with Craving and Aversion. This is the state of being aware and equanimous to the complete experience of here and now. This is the way of Buddhism, with regards to mind and the ultimate nature of minds (and persons). Due to the mind–body problem, a lot of interest and debate surrounds the question of what happens to one's conscious mind as one's body dies. During brain death all brain function permanently ceases. According to some neuroscientific views which see these processes as the physical basis of mental phenomena, the mind fails to survive brain death and ceases to exist. This permanent loss of consciousness after death is sometimes called "eternal oblivion". The belief that some spiritual or incorporeal component (soul) exists and that it is preserved after death is described by the term "afterlife". Parapsychology is a study of certain types of paranormal phenomena, or of phenomena which appear to be paranormal but it does not have any scientific basis  for instance precognition, telekinesis and telepathy. The term is based on the Greek para (beside/beyond), psyche (soul/mind), and logos (account/explanation) and was coined by psychologist Max Dessoir in or before 1889. J.B. Rhine tried to popularize "parapsychology" using fraudulent techniques as a replacement for the earlier term "psychical research", during a shift in methodologies which brought experimental methods to the study of psychic phenomena. Parapsychology is not accepted among the scientific community as science, as psychic abilities have not been demonstrated to exist. The status of parapsychology as a science has also been disputed, with many scientists regarding the discipline as pseudoscience. Outline of human intelligence – topic tree presenting the traits, capacities, models, and research fields of human intelligence, and more. Outline of thought – topic tree that identifies many types of thoughts, types of thinking, aspects of thought, related fields, and more. ^ Descartes, R. (1641) Meditations on First Philosophy, in The Philosophical Writings of René Descartes, trans. by J. Cottingham, R. Stoothoff and D. Murdoch, Cambridge: Cambridge University Press, 1984, vol. 2, pp. 1–62. ^ "mind – definition of mind in English | Oxford Dictionaries". Oxford Dictionaries | English. Retrieved 2017-05-08. ^ a b Clark, Andy (2014). Mindware. 198 Madison Avenue, New York, 10016: Oxford University Press. pp. 14, 254–256. ISBN 978-0-19-982815-9. ^ "20 "Most Important" Philosophers of Mind since WWII". ^ Klopf, Harry (June 1975). "A comparison of natural and artificial intelligence". ACM SIGART Bulletin (52): 11–13. doi:10.1145/1045236.1045237 – via ACM Digital Library. ^ a b c d Karunamuni N, Weerasekera R. (Jun 2017). "Theoretical Foundations to Guide Mindfulness Meditation: A Path to Wisdom". Current Psychology (Submitted manuscript). doi:10.1007/s12144-017-9631-7. ^ a b c d Karunamuni N.D. (May 2015). "The Five-Aggregate Model of the Mind" (PDF). SAGE Open. 5 (2): 215824401558386. doi:10.1177/2158244015583860. ^ "mind – definition of mind in English | Oxford Dictionaries". Oxford Dictionaries | English. Retrieved 2017-08-19. ^ Smith, Jeremy J. (1996). An Historical Study of English: Function, Form and Change. Psychology Press. p. 105. ISBN 9780415132732. ^ "Online Etymology Dictionary". www.etymonline.com. Retrieved 2017-01-02. ^ Başar, Erol (2010). Brain body mind oscillations in scope of uncertainty principle. New York: Springer. p. 5. ISBN 978-1441961365. ^ Israel, Richard; North, Vanda (2010). Mind Chi Re-wire Your Brain in 8 Minutes a Day; Strategies for Success in Business and Life. Chichester: John Wiley & Sons. p. 12. ISBN 978-1907321375. Retrieved 18 April 2015. ^ Masters, Frances (2014-08-29). "Harness your Amazingly Creative Mind". www.thefusionmodel.com. Retrieved 18 April 2015. ^ Ned Block: "On a Confusion about a Function of Consciousness" in: The Behavioral and Brain Sciences, 1995. ^ "Narrow Mental Content". Stanford Encyclopedia of Philosophy. Retrieved 7 September 2015. ^ Whishaw, Bryan Kolb, Ian Q. (2010). An Introduction to Brain and Behavior (3rd ed.). New York: Worth Publishers. p. 72. ISBN 978-0-7167-7691-8. Retrieved 11 May 2012. ^ Sherwood, Lauralee (2011). Fundamentals of Human Physiology (4th ed.). Belmont, CA: Brooks/Cole Cengage Learning. p. 91. ISBN 978-0-8400-6225-3. Retrieved 11 May 2012. ^ Miller (2008). The Mating Mind. ISBN 978-0-8058-5749-8. ^ "Flinn, M.V., Geary, D.C., & Ward, C.V. (2005). Ecological dominance, social competition, and coalitionary arms races: Why humans evolved extraordinary intelligence" (PDF). Retrieved 2007-05-05. ^ "Enhanced nutrition of offspring as a crucial factor for the evolution of intelligence on land". ^ Kim, J. (1995). Honderich, Ted (ed.). Problems in the Philosophy of Mind. Oxford Companion to Philosophy. Oxford: Oxford University Press. ^ James M.R. Delgado (1969). Physical control of the mind; towards a psycho civilized society. Toronto: Fitzhenry & Whiteside Limited. p. 25. ^ Plato (1995). E.A. Duke; W.F. Hicken; W.S.M. Nicoll; D.B. Robinson; J.C.G. Strachan (eds.). Phaedo. Clarendon Press. ^ Robinson, H. (1983): ‘Aristotelian dualism’, Oxford Studies in Ancient Philosophy 1, 123–44. ^ Nussbaum, M.C. (1984): ‘Aristotelian dualism’, Oxford Studies in Ancient Philosophy, 2, 197–207. ^ Nussbaum, M.C. and Rorty, A.O. (1992): Essays on Aristotle's De Anima, Clarendon Press, Oxford. ^ Sri Swami Sivananda. "Sankhya:Hindu philosophy: The Sankhya". Archived from the original on 2006-05-15. ^ Descartes, René (1998). Discourse on Method and Meditations on First Philosophy. Hacket Publishing Company. ISBN 978-0-87220-421-8. ^ Hart, W.D. (1996) "Dualism", in Samuel Guttenplan (org) A Companion to the Philosophy of Mind, Blackwell, Oxford, 265–267. ^ Hubert Dreyfus, "Critique of Descartes I" (recorded lecture), University of California at Berkeley, September 18, 2007. ^ Dennett, Daniel (1991). Consciousness Explained. Boston, Massachusetts: Little Brown. ISBN 978-0-316-18065-8. ^ A thesis against which Noam Chomsky advanced a considerable polemic. ^ Spinoza, Baruch (1670) Tractatus Theologico-Politicus (A Theologico-Political Treatise). ^ a b Kim, J., "Mind-Body Problem", Oxford Companion to Philosophy. Ted Honderich (ed.). Oxford:Oxford University Press. 1995. ^ Dawkins, R. The Selfish Gene (1976) Oxford:Oxford University Press. ^ Churchland, Patricia (1986). Neurophilosophy: Toward a Unified Science of the Mind-Brain. MIT Press. ISBN 978-0-262-03116-5. ^ Churchland, Paul (1981). "Eliminative Materialism and the Propositional Attitudes". Journal of Philosophy. 78 (2): 67–90. doi:10.2307/2025900. JSTOR 2025900. ^ Smart, J.J.C. (1956). "Sensations and Brain Processes". Philosophical Review. ^ Donald Davidson (1980). Essays on Actions and Events. Oxford University Press. ISBN 978-0-19-924627-4. ^ Putnam, Hilary (1967). "Psychological Predicates", in W.H. Capitan and D.D. Merrill, eds., Art, Mind and Religion Pittsburgh: University of Pittsburgh Press. ^ Farah, Martha J.; Murphy, Nancey (February 2009). "Neuroscience and the Soul". Science. 323 (5918): 1168. doi:10.1126/science.323.5918.1168a. PMID 19251609. Retrieved 20 November 2012. ^ Koch, Christof (July 2009). "Do Not Underestimate Science". Science. 325 (5939): 392. Bibcode:2009Sci...325..392K. doi:10.1126/science.325_392b. PMID 19628839. Retrieved 14 November 2012. ^ Dennett, Daniel (1998). The intentional stance. Cambridge, Mass. : MIT Press. ISBN 978-0-262-54053-7. ^ Searle, John (2001). Intentionality. A Paper on the Philosophy of Mind. Frankfurt: Nachdr. Suhrkamp. ISBN 978-3-518-28556-5. ^ a b Eliasmith, Chris; Terrence C. Stewart; Xuan Choo; Trevor Bekolay; Travis DeWolf; Yichuan Tang; Daniel Rasmussen (30 November 2012). 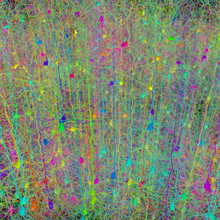 "A Large-Scale Model of the Functioning Brain". Science. 338 (6111): 1202–1205. Bibcode:2012Sci...338.1202E. doi:10.1126/science.1225266. PMID 23197532. Retrieved 13 May 2013. ^ "Computational Neuroscience Research Group". Waterloo Centre for Theoretical Neuroscience. Retrieved 13 May 2013. ^ Thagard, Paul, Cognitive Science, The Stanford Encyclopedia of Philosophy (Fall 2008 Edition), Edward N. Zalta (ed.). ^ Chen, Jing (2015). The Unity of Science and Economics: A New Foundation of Economic Theory. https://www.springer.com/us/book/9781493934645: Springer. ^ "PLoS Computational Biology Issue Image | Vol. 6(8) August 2010". PLoS Computational Biology. 6 (8): ev06.ei08. 2010. doi:10.1371/image.pcbi.v06.i08. ^ Science Framework for California Public Schools. California State Board of Education. 1990. ^ Wheeler, J A. (1979). "Point of View: Drive the Pseudos Out…". Skeptical Inquirer. 3: 12–13. ^ Kurtz, P. (1978). "Is Parapsychology a Science?". Skeptical Inquirer. 3: 14–32. ^ Reuters (5 September 2003). "Telepathy gets academic in Sweden". CNN. Retrieved 9 March 2009. Despite decades of experimental research ... there is still no proof that gifts such as telepathy and the ability to see the future exist, mainstream scientists say. ^ Flew, Antony (1982). "Parapsychology: Science or Pseudoscience?". In Grim, Patrick (ed.). Philosophy of Science and the Occult. ISBN 978-0-7914-0204-7. ^ Cordón, Luis A. (2005). Popular psychology: an encyclopedia. Westport, Conn: Greenwood Press. p. 182. ISBN 978-0-313-32457-4. The essential problem is that a large portion of the scientific community, including most research psychologists, regards parapsychology as a pseudoscience, due largely to its failure to move beyond null results in the way science usually does. Ordinarily, when experimental evidence fails repeatedly to support a hypothesis, that hypothesis is abandoned. Within parapsychology, however, more than a century of experimentation has failed even to conclusively demonstrate the mere existence of paranormal phenomenon, yet parapsychologists continue to pursue that elusive goal. ^ Bunge, Mario (1991). "A skeptic's beliefs and disbeliefs". New Ideas in Psychology. 9 (2): 131–149. doi:10.1016/0732-118X(91)90017-G.
^ Blitz, David (1991). "The line of demarcation between science and nonscience: The case of psychoanalysis and parapsychology". New Ideas in Psychology. 9 (2): 163–170. doi:10.1016/0732-118X(91)90020-M.
Broad, C.D. (1925). Mind and its place in nature. New York: Harcourt, Brace & Company, Inc. Retrieved 7 July 2016.